This is a very good question and one I have asked myself many times over. The answer is not very black and white; it’s was a combination of many factories. In truth at first it was a way of trying to heal myself, if I could just revisit that dark place then maybe I could find some sort of closure. Seeing it down in print made me face my demons, there was no longer any choice. It became so very real and I was made to look into the face of hell - my hell. As my book progressed it was clear that it was becoming much more than that. It was also recognition of a life, and one that I stand in awe of every time I think of her. That someone enriched my life tenfold, I am proud to be able to call that person my mum. This story needed to be shared with the world for that reason alone. I was also hoping to be able to reach out to others, those which may need a hand to hold. Not unlike finding some form of camaraderie in numbers, cemented by the fact that others could and would understand. I am here to say that there is light at the end of the tunnel; you just need to reach for it. It was a message that I needed to get out there to share, that you can and will survive this with faith. To condense this all down by sharing a chapter in my life at its darkest point, maybe it could help others with their own. 2. For your memoir you decided to write it yourself instead of using a ghost writer, are you happy with that decision now that the book is complete? I understand that this book/memoir is just a little different to most other memoirs, as you rightly say I was the one to right this, choosing not to use a Ghost writer. This is something I never even considered, to my mind I had to be the one to do this. I had to somehow try to express the feelings and emotions I felt within its pages, ultimately as no other person could. The best outcome being that you would take the journey with me, strongly believing that this time I would not be alone. I had to travel down that path no question, but it was a lonely road to walk. So the answer to your question is yes I am very happy with the decision I made, no other decision was even in the equation. 3. What message do you want your readers to grasp? This question has to be answered two fold. Many things happen to us throughout our life time some good some bad. The good hopefully outweighs the bad, but for others that sadly is not the case. People looking in on us as we go through such a traumatic life changing experience, may find it's content hard to understand. There is a knee jerk reaction that tells them to turn away; if they don’t recognise it it’s simply not there. By sharing my experience, I am hoping to hold their attention just enough to dispel their fears. Secondly I am hoping to make anyone in a similar situation aware that there is help out there, that you can survive this because you are stronger then you think. There’s a place somewhere deep inside of all of us that has yet been untapped; if you have never had occasion to do so you are unaware of its strength. But at your darkest moment as long as you believe, hold on to life and love you will survive. 4. What advice would you give to someone that is in an abuse situation? It has taken many years of my life to realize, that maybe I was not to blame for everything going on around me at that time, that feeling to be honest never really goes away. I could say that I am now at easy with my involvement, but that would be untrue. So where do you go from there? Forgiveness has to be the answer. Firstly you need to try and forgive yourself, to heal the child that’s inside of us all. The other side of the coin is so much harder, you have to try and make headway in forgiving your abuser. Holding on to all that pain is only creating a mountain of hate which has no real purpose, by holding on to that pain your abuser is still very much in control. I am not in the least saying this will be easy, how could I when I am still struggling to do just that myself. But we have to believe that it’s possible. 5. Are you working on anything right now? At present I am still very much involved with my current books release, but somewhere in the back of my mind there is a continuation. 6. Was writing the book in some way therapeutic for you? Was it therapeutic....... not an easy one to answer. The day I sat down to write I had never been so scared in my life could I really do this? Could I revisit that dark place and come out of it the other end? It was a long hard journey but one I knew I had to take. Sitting here now I know that it has helped me enormously. But while writing there were times that I could not face the next chapter sentence or even the next word. So yes it has been therapeutic, but at that time it was like looking into the fires of hell. 7. 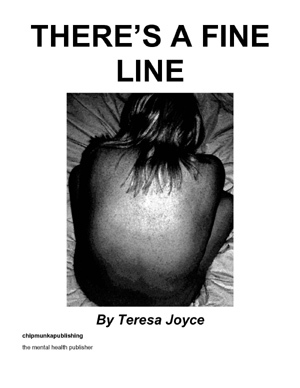 Was your decision to write 'There's a fine line' planned or was it a spontaneous decision? I could not say that it was planned because in truth; it sort of crept up on me from behind getting closer as time passed. To me it seemed like the best way to deal with the demons lurking in the dark corners of my mind. I didn’t get up one day and think lets go write a book! It started as something much smaller - i.e. if I could just write everything down it would feel somewhat like unloading. I could not continue to carry around this amount of emotion/pain any longer without any release. Somewhere along the line it became a book, but at what point this changed I am unsure it just seemed to evolve. Maybe it was the need to help others to do just that, to unload their pain and to face their own demons. You see if my book only helps one person that recognises its content, then it will have been worth all the pain inflicted. 8. If you could have dinner with any book character in history, who would it be? I would find myself in a situation that I had no control over, and in the grip of a complete madman. To follow there would be self mutilation, and the bartering of shot guns as if they were an everyday item. The threat to life was very real, my own included. I would spend many years within the mental health care system; in fact I am still under their care umbrella. I would move from a heterosexual relationship and into a lesbian relationship. Totally at a loss of any understanding from anything controlled by anyone male. I understand that this book/memoir is just a little different to most other memoirs i.e. most are written by ghost writers. This was something I never even considered. To my mind I had to be the one to write this. I hoped and needed to be able to express my feelings within the pages, as no other person could. With the best outcome being, that you would feel like you were taking this journey with me. Strangely I feel an amount of support, being able to think that you are out there. There is a fine line between sanity and insanity; I know this personally, through the experiences I have had to go through involving my stepfather. I also have a personal insight of my own, of a mind battling to stay on the right side of that line, because in truth, I came so very close to crossing over myself.